On Friday, November 18 at 7:00 p.m., the university celebrates the musical talents of its student body with the first ever Battle of the Bands. On stage at Tishman Auditorium (66 West 12th Street) student bands including Static, Zvoov, Greg Raposo, Oh! My Blackbird, Technicolor Lenses, and The Joe Benjamin Project will battle for prizes to further their musical ambitions, including professional studio recording time, paid rehearsal time at a professional New York City space, and a large valued gift card to a local music vendor. A panel of five judges consisting of New School faculty, alumni and music industry professionals will determine the winners. 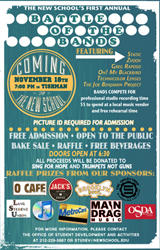 Organized by the Office of Student Development and Activities, the Battle of the Bands is free and open to the public, although a picture ID (university or non university) is required for admission. In addition to the battle, the evening will also include a bake sale and a raffle of prizes from local sponsors like O Caf√©, Brooklyn Bowl, iTunes and more. All proceeds will be donated to the charities Sing for Hope and Trumpets Not Guns. For more information, contact the Office of Student Development and Activities at 212.229.5687 or studev@newschool.edu.